Snacking healthy might be on your to-do list, but the options out there can get out of budget sometimes. We found you five healthy snacks that taste great, keep you fit, and don't burn a hole in your wallet. We believe that the number one knock-you-off-your-diet part of any meal is the dessert–the sweet tooth listens to no one, but Feel Mighty has a different approach. They've got a high-protein and low-carb brownies - in flavours such as Dark chocolate Fudge, Chocolate Peanut Butter and Chocolate Walnut - that'll curb your sweet cravings and make for a healthy snack (the combo of our dreams). 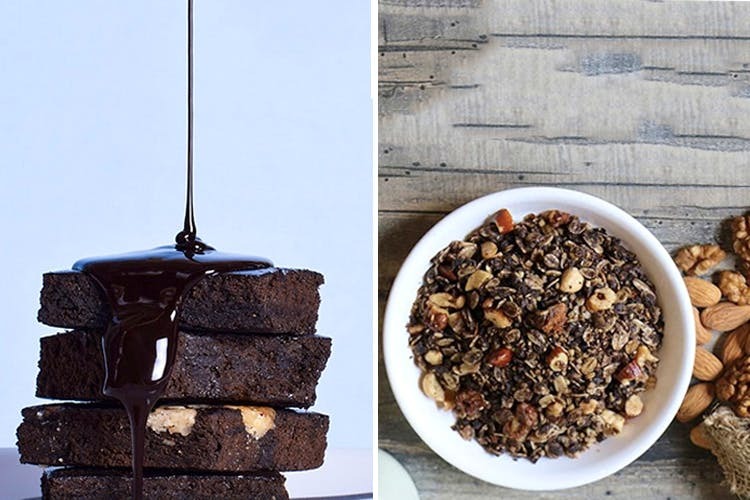 How about a bowl of dark chocolate granola? Nutty Yogi's got a mix of healthy and tasty that'll go quite well with your gym instructor's diet chart. This mix comes in a glass bottle and has oats, Ragi flakes, walnuts, almonds, Chia seeds, orange zest, and of course, the delicious dark chocolate in it. These might look like your good ol' chakhna at first, but they're anything but. To Be Healthy's vegan veggie chips are flavourful snacks that will help you maintain your diet and kill that snack craving, too. These gourmet chips come in flavours like Peri Peri Sweet Potato (our favourite), Tangy Chickpea, Crispy Beetroot, Spiced Okra, and Crunchy Tomato. All that eating has to have some sort of beverage along with it, and while milk or curd might be a good accompaniment for the granola and brownies, Amaara Herbs' matcha tea is the choice of the hour for us. It's a potent green tea with 10 times more antioxidants than regularly brewed green tea (one cup a day should be enough). They've even got amazing flavours to choose from–think mango, peach, orange, and chocolate.